PORA is a non-profit organization serving the interests of the unincorporated community of Sun City West. PORA (Sun City West Property Owners and Residents Association) is a non-profit organization serving the interests of the unincorporated community of Sun City West. All membership and business service fees support PORA’s efforts in being the Voice of Good Government in Sun City West. PORA maintains offices for the Visitors Center and Arizona Office of Tourism, Consumer Services, CC&R’s, Arizona State Attorney General satellite office, U.S. Senator Representative satellite office, Tax Assessor, Association of Condominiums and Homeowners, and PORA Adult Learning. PORA’s Board of Directors serve voluntarily, and look after the interests of Sun City West by working with state, county, and local authorities on issues impacting the community. Find out about our next schedule of classes. You must be a PORA member to register for classes. Not a member? PORA has over 750 Business Connections professionals offering services to our Sun City West homeowners. Whether listed in our online BizConnect Directory, referred through our Consumer Services Department or advertising in our publications, our BizConnect partners are ready to help you. PORA’s Services are numerous! In addition to acting as an advocate for Sun City West residents, PORA provides help with understanding your CC&R’s, help with any complaints or questions, and much more! 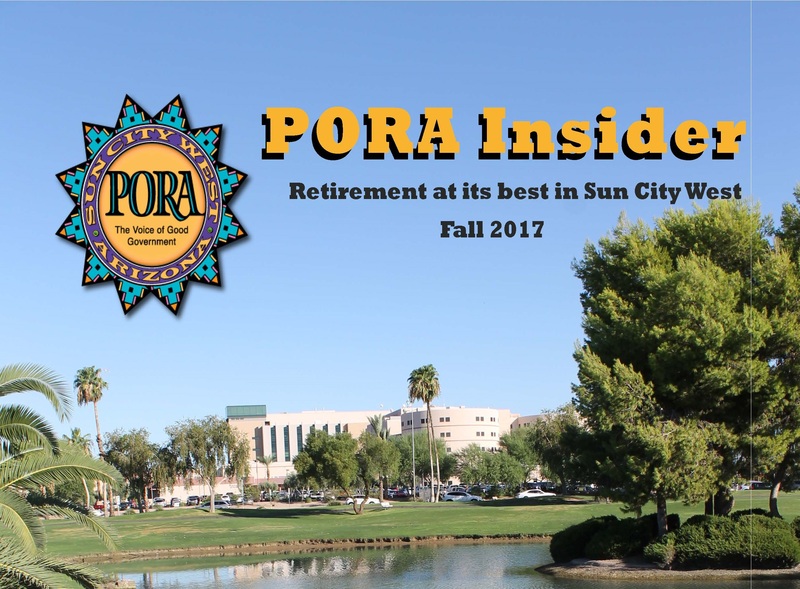 The PORA Insider is a publication which provides interesting information about the community of Sun City West and more! Change to: The PORA Insider is our bi-annual magazine providing interesting information about Sun City West. Whether you are a resident of Sun City West or are considering relocating to our nationally ranked “Best Places to Live’ 55+ community, you don’t want to miss our latest online digital edition.